For too long, women have been kept beyond the boundary. Now, they are storming the field. This is their story. Cricket is a sport noted for the richness of its literature, yet despite all that has been written on the great game there remains a yawning gap – where are all the women? This omission may have been understandable in the early and middle part of the last century, when women’s cricket existed in a twilight world, regarded as a sport for ladies who could perhaps be most tactfully described as ‘unconventional’.But times have changed, and Izzy Duncan’s groundbreaking book comes on the scene not a moment too soon.We begin in the late eighteenth century, when ladies made their first mark on cricket amid frantic betting and rowdy crowds. Then on to the highs and lows of the nineteenth and twentieth centuries, culminating in the contemporary superstars dominating world cricket and on the cusp of going professional. 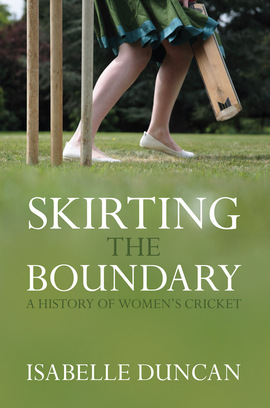 Tracing the history of the ladies’ game, delving into its sometimes murky past and revealing its recent explosion in popularity, Skirting the Boundary is a humorous, charming portrayal of one of the fastest-growing global sports. Fifty per cent of royalties go to Chance to Shine, part of the Cricket Foundation, registered charity 1123385.